Ramshorn snails (Planorbis rubrum) are good for any freshwater tank. Red ramshorn snails feed on algae and feed leftovers which are dangerous for fishes health. Also, these snails server as some special indicator of a tank water quality – if all ramshorn snails have raised up from the tank bottom to the water surface, it means that there’s something wrong with the tank water and it’s time for water renew. There can be seen a lot of negative feedback as for these snails, since they breed rather easily and fill up a tank. But this happens only if the tank owner overfeeds his fishes and ramshorn snails don’t have their natural enemies in the tank. Also it is said that these snails (blue, red, black, brown ramshorn snails) feed on tank plants, but this isn’t true. The misunderstanding occurs when someone sees the snails on the leaves of rotting or dead tank plants and takes them for a reason of this, however the snails are just eating the plant which has already been dead. All ramshorn snails have rather weak teeth to make a hole in a plant, though they’ll eagerly feed on rotting or already dead tank plant. In the wild red ramshorn snails inhabit all over the world. They prefer shallows, waters with slow flow or impounded waters. Quite often such waters are full of rotting plants which give the snails shelter and food. Lack of oxygen in such waters isn’t crucial for ramshorn snails, since they have adapted to breathe with atmospheric air. In the rivers these snails can be seen only in tickly planted backwaters, because they won’t do with high water flows. In ramshorn snail planted tank the species can be of red or brown color. Also some blue ramshorn snails can be seen (Planorbarius corneus var. blue), which have no difference in breeding or care comparing to red and brown ones. This coloring was achieved in pond fish farming after selection and further breeding of species whose shells were without a pigment and the species with common dark brown body coloring. It is this color that shines through the snail’s shell and it is visually taken as blue color by a human eye. However, blue ramshorn snail posterity has some percentage of ordinary colored species (at about 20%). If you want to preserve the unusual coloring of your snails, it’s desired to perform the selection by removing ordinary colored species from a tank. Ramshorn snails have flat voluted shell. The snail’s body (the part that is in the shell) is elongated and cone-shaped and it’s of the same coloring as its shell. The adult species shell itself can be up to 20 mm long and 5 mm thick. To move around ramshorn snails use their quite flat and wide leg which is quite visible outside the shell. The snail has horns on its head – they are long, thin, paired tentaculum – and if you look closer, you’ll see the snail’s eyes on their bottom. Ramshorn snails are amphipneustic creatures, adapted to life in polluted waters with low content of oxygen in water. The snail can breathe both with atmospheric air (by means of its special pulmonary cavity) and with oxygen dissolved in the water. 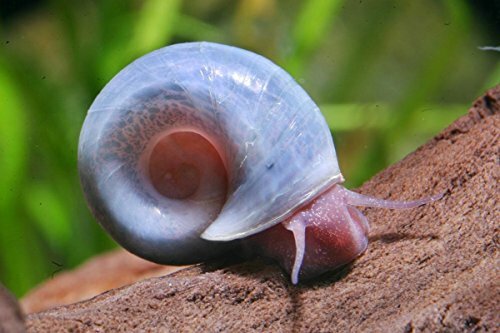 NOTE: young blue ramshorn may look similar to brown leopard snail. Will gain more blue color as the age. Reproduces easily in freshwater aquariums. Great live food starter colony for puffers/etc! Ramshorn snails lifespan is about 1-2 years, very seldom they live longer. Even one ramshorn snail that accidentally got into a tank can successfully breed, since these snails are hermaphrodite species (they are capable of self fertilization). This snail reproduction is that they lay eggs on tank walls, tank plants leaves. Ramshorn snail clutch looks like a transparent node with barely seen round cells. A small snail will grow in each of these cells and in 2-3 weeks it’ll go out to start its own life. These snails prefer warm water 75–81 °F (24–27 °C). They can feed on almost everything – vegetables, rotting plants, fish feed, dead fish. You can complement the snail diet with – lattice, cucumbers, squashes, cabbage. All these vegetables should be boiled for a minute and they should be given to the snails in small pieces. One of ramshorn snail peculiarities is its ability to swim on the water surface with its shell turned down. The snail achieves it by adjusting the floatage of its body – to do so it gets some additional air into its shell. When swimming the snail leans on water surface tension or bacterial slime. If it is touched during its swim, it’ll immediately let the air out and drown. This reflex helps ramshorn snail to escape from predators in the wild. There’s nothing difficult in keeping of these snails in a tank. It’s quite enough to put them into the tank, they’ll find the feed themselves. Besides, ramshorn snails get into the tank together with plants and decorations where they put the eggs. So, if you see some snails in your tank – don’t be surprised, it’s ok. The snails are completely peaceful and well-behaved to their tank mates – fishes and prawns. Ramshorn snail can feed on dead fish and sometimes it makes people think that the snail has killed it. However, if the snails colony is overpopulated, some fishes eagerly feed on them – for example, clown loach or paradise fish.